Philip Eglin has added much to the language of figuration in the last thirty years, but his work also encompasses big buckets, plates, dishes, jugs and smaller more intimate tablewares. Born in Gibraltar in 1959, Eglin studied ceramics at Staffordshire Polytechnic and the Royal College of Art. 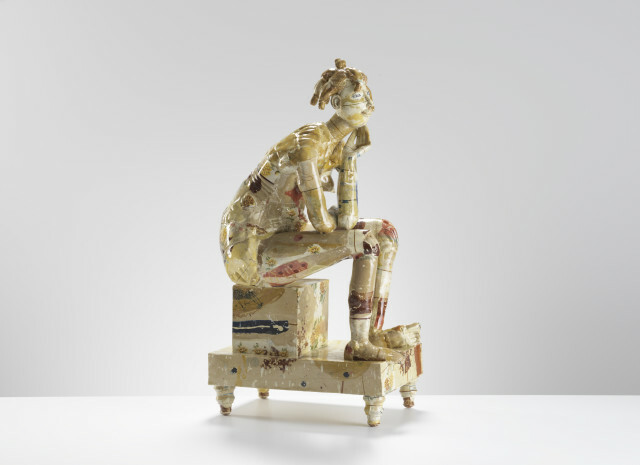 In 1996 he won the Jerwood Prize (Ceramics), having quickly established a reputation for his fluently modelled and painted sitting, standing and reclining nudes. Madonnas, popes and cardinals followed, his ideas drawing as much on the history of sculpture and painting as ceramics, as well as everyday modern culture and imagery, in terms of both subject matter and the discarded paraphernalia with which he makes his moulds. Eglin is an accomplished social critic, but his view of the world is tempered by playful wit and celebration too.